Jon Kabat-Zinn, a tireless advocate of mindfulness meditation, sees parallels between the mind and the Pacific Ocean. Waves of emotion may roil the surface, but 30 feet down, all is peaceful. By tuning in to every breath as it travels through your body, you can dive into that basal oasis. Mindfulness, or being keenly aware of the present moment without judging what is happening, can lift moods, hone focus and improve health. As psychologist Amishi P. Jha writes in her cover story, “Being in the Now,” on page 26, this cognitive cure-all may work by strengthening the brain's attention mechanisms. Living in the present, of course, is not the same as ignoring the future. Yet that is what we do when we cave in to a fast-food hamburger or bust our budgets with a shopping spree. In “Time-Warping Temptations,” journalist David H. Freedman explores why we overrate the treats of today and cheat our future selves. Turn to page 45. It's easy to lose our cool, especially in a metropolis, with the stress of congested streets, crowded sidewalks and the loneliness that can emerge amid thousands of strangers. Urban living can harm the brain—notably by increasing the risk of developing schizophrenia. Psychiatrist Andreas Meyer-Lindenberg explains why in “Big City Blues,” on page 58. Fortunately, emerging therapies for schizophrenia are helping patients overcome the disorder's often ignored social and cognitive deficits, which make building friendships and living independently so tough. 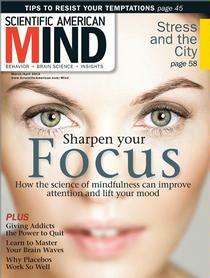 See “A Social Salve for Schizophrenia,” by psychologist Matthew M. Kurtz, on page 62. But first, take a look at the lively design we're unveiling for Head Lines. We've packed it with fresh features. In a new column, How to Be a Better..., we share tips for upping your performance; this issue focuses on driving skills. And the first installment of Pharma Watch, which highlights trends in drug research, looks at old medications that are finding new life as brain treatments. Check out the ticker along the bottom, too, to pick up some fascinating facts. We hope you love what you find.